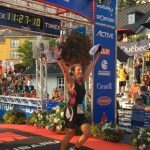 I had the great pleasure of competing in the Olympic distance triathlon at Wasaga Beach on August 25, 2018 with my daughter Kathryn (who will turn 20 in November). We decided to make a week-end out of it, and booked a motel right beside the transition area for both Friday and Saturday nights. What a perfect location – we walked back and forth between our hotel and transition 3 times before the race (we each forgot our water bottle), and twice after (before the awards ceremony). Good thing I booked it in January!! The weather forecast was for strong winds and possible thunderstorms, and this race has been turned into a duathlon quite a few times because the waves can have white caps even in August. Fortunately, the weather behaved, and while it was windy, we only saw a few drops of rain, and the water was relatively flat. One of our few complaints about this race was the late start, since they held the sprint distance at 8:30 and the Olympic race started at 10:30. That meant we were battling warmer temperatures and high humidity for a race that typically takes 2.5-3 hours. Typically, triathletes are sorted into start waves by their age, and as an older female, I tend to be slotted into one of the later waves. As a strong swimmer, this puts me at a disadvantage since I have to swim through arms and legs as I pass the slower swimmers in the waves ahead of me. New this year, Multisport offered athletes the opportunity (at a price of $7) to choose their own wave. I paid the fee and selected the first wave, but my daughter gambled and saved her money. The money was well worth it for me, as I was able to keep up with the men in this wave. It was a bit choppy across the top (after the first turn), but I had one of my best ever swims, and finished 1.5 km in 23:55 (averaging 1:35/100 m). This was a PB for me (2 minutes faster than previous years). I think this was because I could just follow the swimmers ahead of me, and stayed relatively straight (instead of being alone and going off-course, or dodging other swimmers). I appreciated the extra applause from the fans as I crossed through the arch. Kathryn had a good swim, but found it difficult to navigate past some of the swimmers ahead of her. I was alone at my rack in the transition area (since my age group started 12 minutes later), and grabbed my bike to set off on the bike course. I was alone as I crossed the mount line and had my own space. Kathryn was not so lucky, as she experienced a bottleneck of several riders at the mount line, and had to wait before crossing the line and finally getting on her bike. The bike course changed from previous years, and only had a few turns and 1 turn around. The roads were well maintained, and the drivers were considerate. We started with a tail wind, and enjoyed a fast start with some downhill sections. I was trucking along at 45 km/h going north on Highway 29 for about 4 km (but getting passed by 2 male cyclists). We didn’t enjoy the 90 degree turn at the bottom of a hill followed by a steep uphill with no momentum, but we powered through. I struggled with the u-turn, but stayed upright, and braced myself for the head wind I knew was coming. I waved at my daughter as I passed the 23 km mark and was happy we were both having a good race so far. The head wind up the hill on Crossland (Highway 29) was pretty tough, and I was grateful to turn off and head back to transition. The riders passing me were mostly polite and supportive, but not many of them were calling “on your left” as they passed. I didn’t pass anyone, but this wasn’t too discouraging considering where I was positioned after the swim. I was happy to see that my bike time was just over 1:10 ( 2 minutes ahead of my goal), partly because the course was 39.2 km! I returned to transition to an empty bike rack, and quickly changed into my running shoes. I thought I pressed the run option on my watch as I left transition, but apparently I pressed the cycling button, so I didn’t have the kilometre update screens I am used to and had to check my time manually. The run course consists of two 5 km loops, allowing runners to run past spectators twice. The course had some minor changes from previous years, and some portions were now on a path parallel to the main road. It was nice not battling car traffic for those sections, but there were sandy portions and some speedbumps, and a few narrow bottlenecks. The volunteers at the aid stations were friendly, and some even called out drink orders ahead so the drink was ready for the runners as they ran by. The p-turn at 2.5 km was much easier than a u-turn, but we had a hard u-turn at the 5 km turn around. It was also tricky to cross the paths of the incoming runners to run back towards the turn around and finish line. I started out quickly, with the first 5 km averaging 4:52 minutes/km. I decided to run past the aid stations and didn’t take in any water or F2C – felt like a good idea at the time, but that might explain why I ran out of juice at 8.4 km. The markers weren’t evenly spaced, which made some kilometres feel longer than others. I struggled at the end, averaging 5:06 min/km, but the final time was 49:49 for 10.06 km, so I averaged under 5 min/km, which was my goal. My final time was 2:27:33, which beat my previous PB by 4 minutes. My daughter Kathryn also set a PB of 2:33:26, crushing her previous PB by 10 minutes. We were both first in our age group, which made the award ceremony very special (even in the light rain). 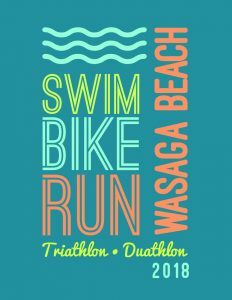 Overall, Wasaga Beach is still one of our favourite triathlon races, and we have many fond memories of restaurants (dinner and breakfast) and post-run treats (ice cream, funnel cake, Beaver Tail). We hope to continue racing this race for many years to come!